Disability Equality Scotland is celebrating its recent success at the Sensory and Equality Awards 2019, held in Glasgow on Friday 15 March 2019. The Awards followed a successful conference held jointly by deafscotland and Disability Equality Scotland to showcase inclusive communication and ensuring that communication really is for all. We were runner-up in the category ‘Multi-sensory and inclusive communication approach to communication in Scotland’ which was sponsored by STV Signpost. Scottish Parliament Public Information and Resources won the category. We were acknowledged for our work in promoting inclusive communication. As hosts of Scotland’s first Inclusive Communication Hub www.inclusivecommunication.scot we advocate for the use of plain and simple language to get their message across. 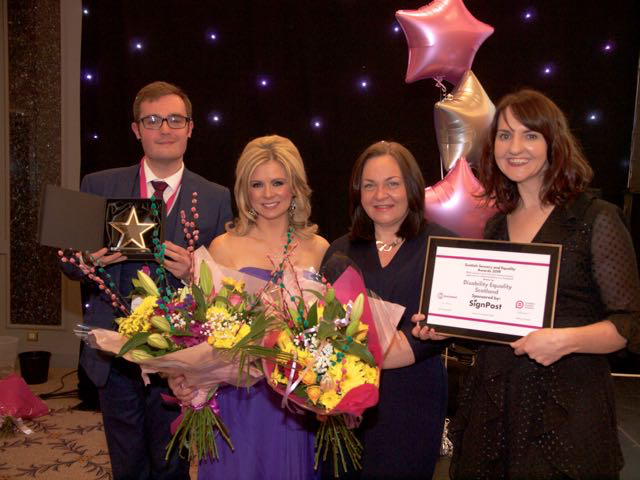 Please find attached an image of Ian Buchanan, Morven Brooks and Emma Scott from Disability Equality Scotland collecting the award, presented by Kelly-Ann Woodland from STV News.